The Boston Tax Help Coalition kicked off its eighteenth season of free tax preparation services with the help of Mayor Martin J. Walsh and community partners at a launch event held Tuesday at the Roxbury Center for Financial Empowerment. The Coalition provides free tax services at more than 30 sites throughout the Boston area to workers who earn $55,000 or less per year. The Coalition serves approximately 13,000 taxpayers yearly and last year enlisted hundreds of volunteers to return $24 million in refunds and credits directly to taxpayers. Cynthia Jones, a Roxbury resident and mother of four, was one of those taxpayers. With the help of her volunteer preparer, she received the largest tax refund she had ever received. That refund, along with the personalized financial coaching she received at the Roxbury Center, enabled her to take a vacation with her family for the first time this year. “Financial coaching allows you to have an accountability partner with your finances,” she said of the coaching offered at the Center. 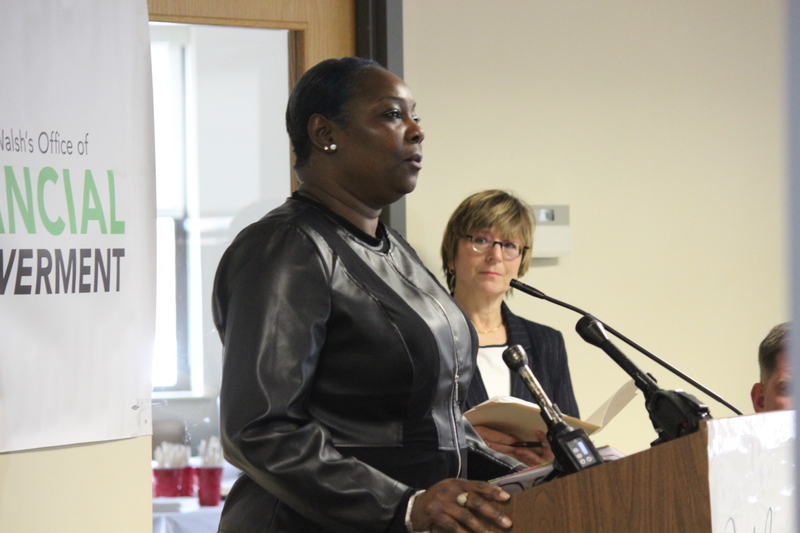 Cynthia Jones shares her story at the Boston Tax Help Coalition launch, as Coalition Director Mimi Turchinetz looks on. The Coalition will conduct Financial Check-Ups at 15 tax sites (up from 12 last year) and new this year, will use the Financial Check-Up as an outreach tool to identify taxpayers who re interested in homeownership. These aspiring homeowners will be eligible for Homebuyer Readiness workshops funded by a newly awarded $175,000 grant from the Wells Fargo Foundation. “It’s important as we build more affordable housing, we want to be sure people…have the opportunity to own their own home,” Mayor Walsh said at the event. 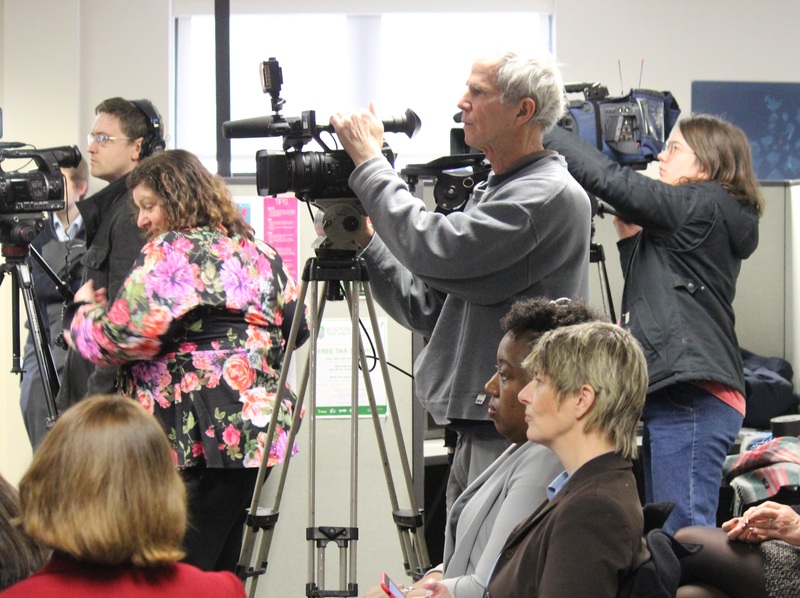 Media outlets attending the event helped publicize the new season of free tax services. John Drew, president and CEO of Action for Boston Community Development (ABCD), urged attendees to get the word out about these opportunities. The free tax services, which are available at multiple ABCD locations, can help residents claim money at tax time that could otherwise be left on the table – from the circuit breaker tax credit for senior citizens to the Earned Income Tax Credit for low- and moderate-income workers. He noted that while the recent federal government shutdown had introduced some uncertainty to the tax filing process, Boston’s partners remained committed to helping residents maximize their refunds. Read the BPDA press release about the event.